It’s nearly Christmas. Let’s drink, be merry and eat cheese! When you’re a child, Christmas is a massive deal. You count the days, and lie in bed straining your ears for the sound of sleigh bells and the clattering of hooves on the roof. The big day passes in a whirl of Chocolate Oranges and those Matchmaker chocolate sticks (well, in my case it was the 70s…) and you fall into bed exhausted, hot-faced and happy. Then you grow up, and Christmas might plummet into a cobbled-together affair in a grotty flatshare with nothing to eat but Shredded Wheat with a smearing of Rose’s Lime Marmalade – because you’ve spent all the money on drink. Still fine, though. There’s something terrible thrilling about shaking off family traditions and doing Christmas your way. Or maybe you still return to the parental home and relish everything being just as it was. My own family situation meant I didn’t experience this much beyond my early twenties, so instead I enjoyed creating traditions of my own. During my thirties, I lost it a bit. With three children it seemed hugely important to create this amazing, perfect festive extravaganza, with limited resources: dragging a real seven-foot tree down the high street as it was the cheapest way to get one (apart from creeping into a pine forest at night, with a saw, which a friend still does. Sometimes, she sneaks back in the following night because the first one wasn’t quite right). We made out own cards back then, creating a glitter tornado in the kitchen. Dinner for ten was crammed into a malfunctioning 1950s oven in our new (by which I mean old and crumbly) home, much to the consternation of our assembled relatives. And now? Well, I’m over all that. For everyone who groans about Christmas, claiming that they just want to run away to India or a little cave somewhere, maybe it’s a case of making a big, stressy thing out of what should just be really… fun? Gathering spiky foliage from the garden, like a country maiden, and draping it over the mantelpiece. Bringing a branch home from the park and spraying it silver. 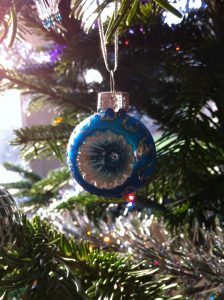 For years, I persevered with this bizarre tradition. It never looked festive. It just looked like a manky old branch. Trying to ‘force’ hyacinths, whatever than means. Giving edible presents I’ve made. I’m always delighted to receive home-made things; I just have no wish to spoil anyone’s Christmas with my disappointing truffles. Hand-printing wrapping paper with a little rubber stamper. Running around tidying up all day, like a paper-gobbling machine. Feeling bad about getting a bit giddy, or everything not being like it is at Nigella’s house. Rationing myself of cheese, or in fact anything. Really, it amounts to one day with lots of food and telly. That’s the way I look at it now. It’s a day. You’re not at work. It’s perfectly okay to have a glass of Prosecco for breakfast. And on Boxing Day a pile of friends come over, and we all tear into the leftover food, play drunken board games and appear in possibly the worst photos ever witnessed. I can’t wait. I love a list. I couldn’t survive without lists. Well, I could, but I’d be in a permanent flap and miss deadlines and there’d be nothing to eat for dinner. Since I was a little girl they’ve been a crucial part of my life – stuff to pack for a holiday, things I hoped to do when I was a grown up, plus lists of favourites – songs, TV shows, possessions. I diddled away with my lists, paying less attention to them during my chaotic twenties – and then kicking into serious list-making on an industrial scale in ’97, when our twins were born. Suddenly, living haphazardly with nothing in the fridge but a lump of cheese and some suspect milk didn’t seem quite so much fun. One simple factor seemed to dictate whether the day was relatively disaster-free – and that was whether I was organised or not. Which meant writing down everything that seemed crucial to the survival of these two tiny people. For one thing, I had to learn to cook. In my previous, pre-babies existence I used to buy ready-made bolognaise sauce (nasty) when friends were coming over and bury the boxes at the bottom of the bin. Now it was necessary to cook proper meals, which meant having the right stuff in, which in turn meant remembering to buy it all – thank God for lists! Armed with a notebook, a pen and a Jamie Oliver cookbook, I slowly managed to cobble together reasonably okay-ish things to eat. There was work to keep track of, too – I carried on freelancing a little during my sons’ nap times, if I could manage to synchronise them (brandy helped. JOKE!!). Notebooks were filled with magazine feature ideas, plot outlines and titles for books I hoped to write one day (I had yet to write anything longer than 3,000 words). Floundering in the fug of early motherhood, I listed ways to rejoin the human race: Drink water. Sort hair. Change out of dressing gown. There were lists, often scrawled in the night, about how to be a better person: Don’t smoke. Donate blood. Read Crime And Punishment. Be nicer to J. Oh, and the usual daily stuff: Eggs. Sterilising Solution. WINE!!! 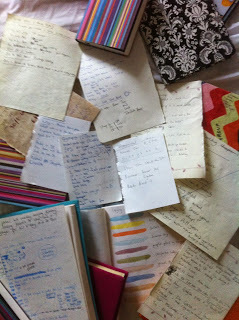 During those frantic days, the very act of writing things down was somehow reassuring in itself. A list says, ‘This can – and will – all be done.’ It’s excellent for calming the brain. The act of crossing things off, as any list maniac knows, is immensely satisfying. A friend of mine scores things off her list before she’s done them – to make herself ruddy well get on with it. What I love about lists is the fact that they’re always lying around – forever handy – to be added to the instant you think of something. Dog licking foot obsessively? Call vet. Bad smell in shower? Get stinky egg drain stuff. I list everything: books to read, films to see, Ways To Improve Our House. As I’m in the process of selling Mum’s house for her, that has a list of its own. My list making goes through different phases: in notebooks, on my phone or laptop, on an array of Post-It notes plastered all over my desk. If someone were to steal all my pens, phone and laptop, I’d probably write one in lipstick. Well aware of my love of lists, Jimmy bought me a brilliant book called Lists of Note, compiled by Shaun Usher (Canongate). 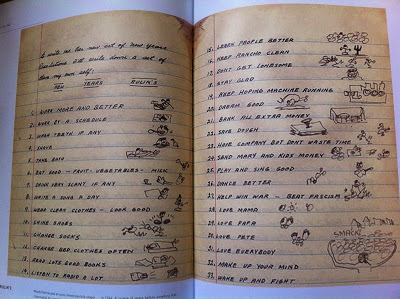 Among the 125 lists are the scribblings of Jack Kerouac (his list is entitled, ‘Belief & Technique For Modern Prose’) and F. Scott Fitzgerald (‘Thing To Worry About’). That’s Woody’s list in full, above. Makes my own to-do list (mum/vet/blog/accounts/Gracie b’day/cheese/J’s shoes/call Carrie) seem pretty mundane. But I guess that’s the whole point. Whether you’re writing down things to achieve by the end of the decade, or just the ingredients for dinner tonight, everything feels more achievable when set out in a neat little stack of words. I was packing for a weekend jaunt to Liverpool last night when it hit me… just take dresses. I LOVE dresses. I especially love them in winter when you can wear them with chunky cardis and – best of all – thick black opaque tights. If I’d read that back in the late 70s I’d have been very pleased indeed. In fact, as far as I can recall, we had to wait until the mid-’80s for proper sturdy opaques to appear. I certainly remember the fashion department becoming quite dizzy with excitement over Wolfords – Fashion Ed Karen’s preferred brand – when I worked at Just Seventeen. Soon, the entire staff’s legs were encased in thick, matt black nylon (apart from Andrew’s, Andre’s and Scoffer’s – ie the lads. But I saw them them glancing over, jealously). 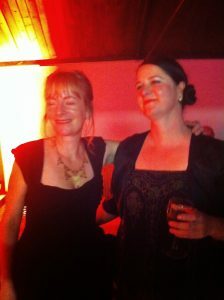 I do always go for black, although more adventurous friends sometimes step out in teal, plum – even red. They look very bold and dashing. They’re just not quite my style. Anyway, I started off intending to write about dresses, and how great they are because they remove a tiresome step in the decision-making process: ie, what goes with what. I’ve never been terribly good at putting things together, and a dress means you don’t have to bother with any of that. 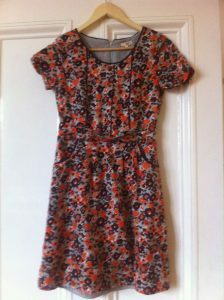 The dress above is my current favourite: Hobbs, but from a charity shop. Can I just add how delightful it is when you see something you love in Oxfam, and it fits perfectly? I mean the odds are pretty low really. So it’s far more satisfying than just wandering into a high street store and selecting your size off the rail. In fact, it’s as pleasing as the first day of Tights Season. I have never understood the appeal of blamming wildlife with a big gun – but I’d imagine that those who enjoy it experience a similar thrill when the grouse season starts. But never mind that. We are now in the thick of opaques season which, in our chilly northern climate, can easily stretch to about nine tenths of the year. Hurrah for tights! I couldn’t wait to get my hands on India Knight’s new book, In Your Prime: Older, Wiser, Happier (published by Penguin). 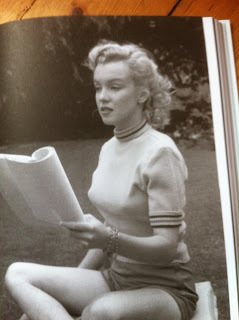 I love her non-fiction writing. It rattles along, and you feel like you’re in a cosy corner of a bar with her, getting stuck into a bottle of wine. There’s advice on pretty much everything about being an older (ie, post 40-ish) woman here, although often it reads more like India’s breezy thoughts on a topic, rather than anything deeply researched – which is fine. It’s all I really need right now on the subject of menopause, ageing parents and stomach holder-inner pants. India touches on crepey cleavages (bugger all you can do about it) and how to avoid looking muttony. She advises on whether to try Internet dating (yes), have an inappropriate crush (no) and how to enjoy pottering about, doing nothing much, and not stressing about it either. So it’s all good, illuminating stuff. As an aside, having turned 50 last week, I’d like to add my own checklist of stuff to bear in mind, now I’ve hit that half-century. 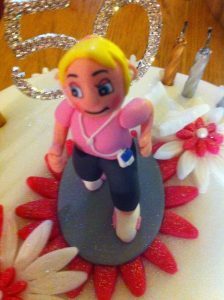 That’s my cake above, created by my talented friend Elaine. For the moment I am choosing to ignore India’s suggestion that my old-lady knees are no longer up to the job of running. A hairdresser told me she always uses a magnifying mirror. I could’t believe anyone would willingly inflict such trauma upon themselves. But then, she is 27 and very beautiful. At my age, I wouldn’t dream of magnifying anything. In fact I prefer to undertake any mirror-related duties without my glasses on. Saying, ‘Where are my glasses?’ is a phrase uttered far more often than, ‘Where are we going tonight?’ We’re staying in, that’s where we’re going. To hunt for our glasses. We all know it’s more flattering to have your photo taken from slightly above. I now ask anyone wielding a camera to do so while teetering at the top of a wobbly stepladder, thus creating ‘blur’. …And to buy a bagged salad and fry and bit of fish and say, ‘Dinner’s ready.’ I no longer feel required to create a sumptuous meal in an attempt to please everyone – because it never did. By this stage, everyone is perfectly capable of foraging about at the back of the fridge anyway. My friend Tania reckons that, due to rapidly-dwindling oestrogen levels, I am losing my nurturing tendencies. Certain types of music are becoming unpalatable to me and that’s fine, I don’t have to pretend to like it. As I type, the lyric, “F*** ma ho'” has just boomed through the house. Another apparently favoured track involves a man screaming – not in a belting out lyrics way. I mean really screaming, as if being burned. No need for waves of crushing self loathing the morning after a boozy night. I am over that now. The morning after my 50th birthday – possibly the best night of my life – I woke up fully attired in a black dress and tights and thought, This is all right. This, I can handle. I’d tumbled into bed at 5 am after a night with my very favourite people in the world. That, I decided, is all that really matters: not wrinkles or saggy bits or spotting the odd scary hair poking out from the chin. Just being with people I love, and laughing. A lot. And I’ll be too busy doing that to sort socks. Mum moved into a care home a month ago, and I’ve spent the past few weeks clearing out her house. It’s the kind of job I’d have imagined to be pretty harrowing – but in fact, the enormity of the task has been helpful. There’s been no time to dither over every item. Instead, I’ve clicked into practical mode. The whole process has also made me realise that, in most cases, things are just things: the stuff we collect over decades without stopping to consider whether we still need or want them. 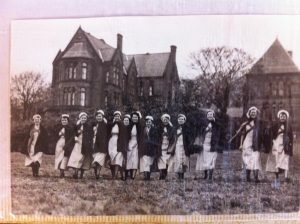 When it comes down to it, all that really matter are photographs – like the one I found of Mum and her fellow newly-qualified nurses in Liverpool in the early 50s. There are very few photos of Mum as a young woman so I was delighted to find one where she looks so happy and proud. Mum, who’s fifth from the right, loved being a nurse. 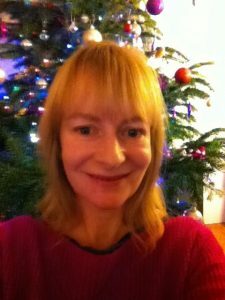 She left the profession before I was born in ’64 – she and my dad ran a youth hostel, then Mum helped with his photography business – but returned to it in the 80s, driving all over South Ayrshire as a Macmillan nurse. I’ve kept a few mementoes from Mum’s house, but her vast collection of fabrics (she was an avid crafter and quilter) has been passed onto neighbours and friends. Mum would want her belongings to be used and enjoyed. Daughter and I spent a lovely couple of hours sifting through an entire attic’s worth of material, selecting the special vintage pieces to pass onto our creative pal Cathy. Amazingly, some of the sorting has been enjoyable – even fun. I found Mum’s ice skates, which I wore in the 70s to skate around the Silver Blades ice rink in Bradford. No one else had their own skates! I loved them. I’ve also unearthed fantastic vintage knitting patterns and dressmaking books. I probably took Mum’s creativity for granted until I was faced with her entire collection of fabric, wool, threads, three sewing machines (!) and a host of half-finished projects. Mum also dabbled in embroidery, woodwork, calligraphy, stone polishing (she requested a stone polisher for her 70th birthday) and even had a go at making marbled paper. There was nothing arty or crafty that she would’t try. As a little girl I loved that she could make me dresses to match my own whims and preferences – until I started to covet the styles depicted on Jackie’s fashion pages and yearned for C&A jeans and Miss Selfridge gypsy skirts. 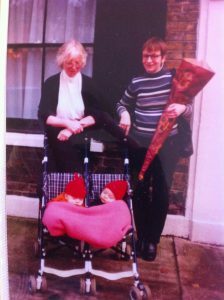 Mum kept on sewing clothes for herself, and when my twin boys were born in ’97 she presented them with beautiful hand-made quilts, blankets, soft toys and pyjamas made from Butterick patterns. I love to think of my crafting friends’ sewing machines whirring away as new things are made from the fabric of a lifetime.